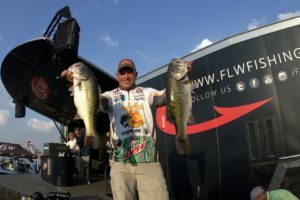 In the hot dog days of summer deep water ledge fishing can be one of the most productive ways to fish. 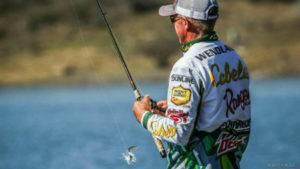 Here’s how I approach ledge fishing. 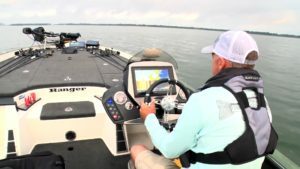 First, let me say, I’m not crazy about ledge fishing in tournaments because you often have to bunch up to get to the best places, but if it’s a tournament where I can have a place pretty much to myself, I’ll give it a go. Otherwise, I look for something else where I can avoid the crowd. But if I’m not in a tournament and filming or fishing for fun, I love ledge fishing. 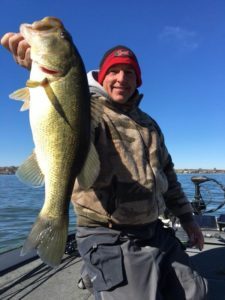 The first thing I do is make sure I have quite a few rods rigged up (six or seven) – football jigs, a few deep diving crankbaits, Carolina rig, and a flutter spoon (something I can jerk up off the bottom and it will flutter down slowly). 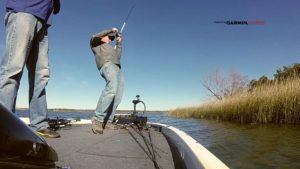 I generally will rig it with Sunline Sniper fluorocarbon, which is a dense line that cuts through the water well, and gets the bait down into the strike zone. Then I need to know how deep to get, which, in Texas is generally about 15-25 feet. Then I use my electronics to look for structure and schools. The Garmin Panoptix is an amazing tool for this type of fishing in that you can actually SEE schools of fish when you get close to them. So rig up a lot of rods on fluorocarbon line, determine the depth, use your electronics to find schools if possible, and get out there and have fun catching. In the early Fall, you often see lots of big Gizzard Shad. Bass love these giant shad, and you want to go big with your set up to target these fish. 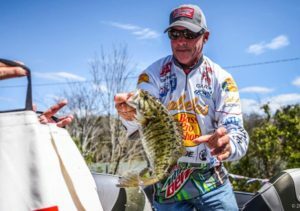 When you start noticing big Gizzard Shad, think big baits. I like to use a big Strike King 3/8 oz. buzz bait with a Rage Toad on the back of it. As the water cools (even down to the 50s, you can catch them with this reeling pretty slowly. I also like big spinnerbaits or even a KVD 8.0 or 4.0. The 4.0 is smaller, but still works when bass are keying on big shad. 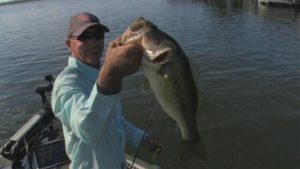 So in the fall of the year think big baits for bass that are targeting big shad. 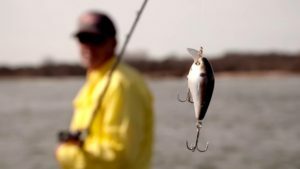 Flipping – Its All About the Hook! 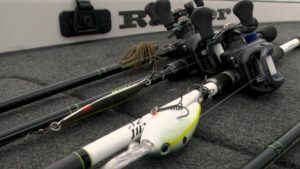 Probably the most important part of any flipping set up is the hook you choose to use. Personally, I like a straight shank hook. I think it gives me the best hook up ratio. It’s easy to rig, and the bait stays very straight. The hook I have recently started using is an Owner Jungle Hook (with zo-wire). This hook is extremely strong. Four times stronger than other hooks with the same size wire diameter. Having smaller wire, it penetrates the fishes mouth very easily. And I have found my hook up ratio increasing dramatically since using it. It has a great keeper, keeping the head of the bait up and is by far the best hook I have seen – period.